For those of you either to young to remember or too old to care, Freddy Krueger’s franchise, ‘A Nightmare on Elm Street’ was possibly the most popular horror movie series this side of Friday the 13th. Before Johnny Depp was Johnny Depp, before all the crappy remakes, Freddy Krueger was torturing dreamers with razor sharp wit and corny punchlines. 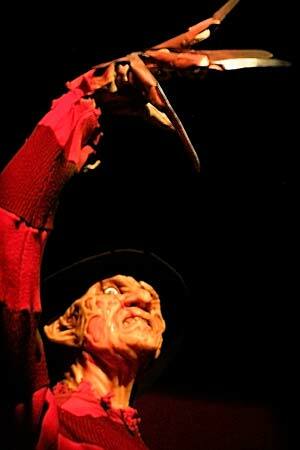 In his dream haunting, Freddy straddled the line of making us kids laugh and causing us to have endless nightmares. His green-and-red striped sweater and fedora became Freddy’s trademark and the Nike shoe incorporates the stripes with actual sweater material and a blood splattered exterior to create an iconic shoe for the ages. Nike’s attention to detail is amazing and extends all the way to the sole of the shoe: it’s patterned after Freddy’s flesh-burned face. The first time I saw ‘A Nightmare on Elm Street’, I was 7 years old. I watched it at my older cousins’ house and when Freddy’s infamous bladed hand came through that faucet, it came into my consciousness forever. As I got older, I formed this almost-friendship bond with Freddy through his movies all the way to ‘Freddy’s Dead’. I don’t think there will ever be another pop culture monster like him. I mean, how many horror movie baddies have their own shoe? Several Internet searches and visits to local shoe stores later, I found them. I remember when the package came in the mail and I opened the box to find my elusive delight. Fast forward a couple of years and the shoes are utterly disgusting. The blood splattered design has been replaced with actual blood from walking in them so much to the point I got mad blisters. What can I say? The shoes are just too dope not to wear! Besides, I think Freddy would appreciate the more authentic blood anyway.